Home › Uncategorized › Vote Results — Two Factions Join The Sixth Arc’s Lineup! 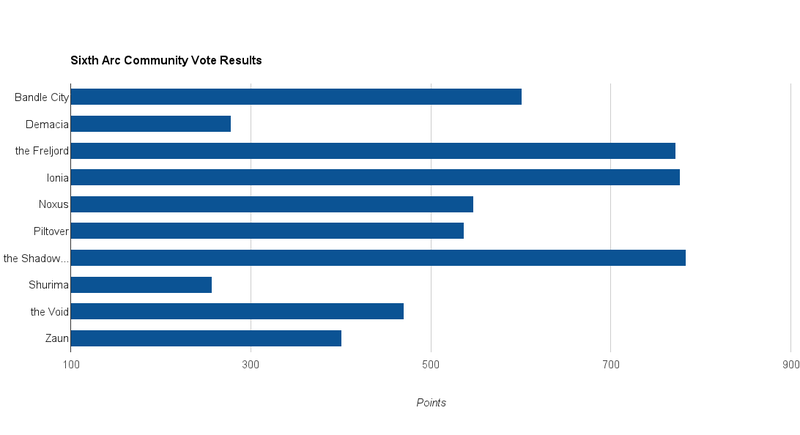 Vote Results — Two Factions Join The Sixth Arc’s Lineup! The sixth Factions storyline begins soon. 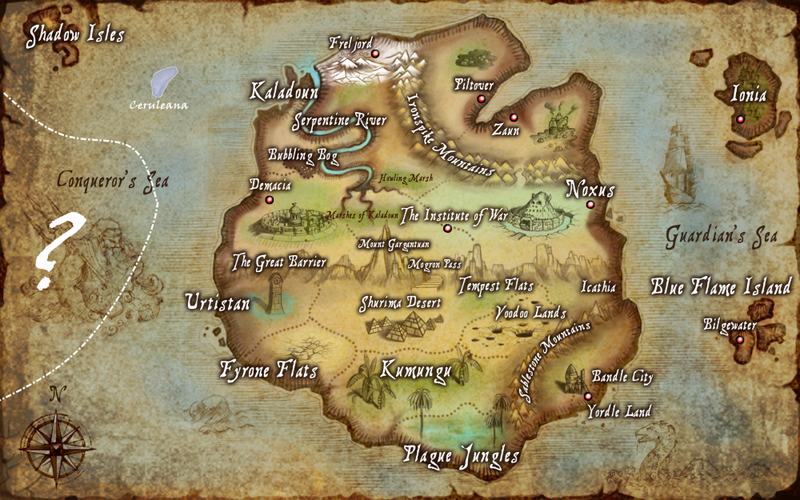 It will center around the exploration of a new continent discovered to the west of Valoran. The Council has banned any travel to the continent pending the formal initiation of a League adjudication to govern the matter. The nations of Valoran are now petitioning the League to be among those factions chosen to voyage to this new continent and represent Valoran to whatever peoples may there be found. Bilgewater was the first nation to have its petition approved. As the de facto representative of maritime interests, this development was unsurprising. After much debate, in which the voices of over 500 Summoners were heard, the League has announced a favorable ruling on two more petitions. The Serene Realm of Ionia, as well as emissaries of the necromantic domain of the Shadow Isles, will be participants in the pending adjudication, and shall be authorized to travel to and explore the new continent when that adjudication begins. Upon hearing the news, rumors have begun to circulate of dark pacts made between the necromancers of the Shadow Isles and Council Summoners. Some suspect corruption and bribery; others believe that the Council is attempting to stave off an undead invasion by handing over this new land and its inhabitants to the Isles. Many now turn to Ionia, hoping that these guardians of balance and harmony will find a way to keep the likes of Karthus and Mordekaiser in check. Karma delivered a short address from the Ionian embassy on the grounds of the Institute. The Shadow Isles, traditionally a minor participant in the League’s disputes, has already begun soliciting recruits for its cause. It is reported that a visibly intoxicated Gangplank then entered the hall in which Karthus was making his address. “Yar har har! Ye dry sack o’ bones!” The pugnacious Champion’s brandishing of a cutlass brought the Institute’s guards forward to restore order. Before being hauled away, the swarthy pirate flung an empty rum bottle into a crest of the Shadow Isles hung upon the wall. He then once more addressed the gathered Summoners as the guards moved forward and seized him. “He’ll make dead men of the lot o’ ye! Exceptin’ those who wind up a meal for the Spider Queen or share the Widowmaker’s bed!” One shove threw a guard from his burly arm, enabling him to loose a sack of coins and scatter them among the crowd. “Those doubloons be but a token! Top rate is what we pay our crew! So all ye robey wizards and witches get on board a’fore we sail!” Several more guards hurried forth, and together they were able to haul him off. As he was dragged out through a side door, he shouted, “TOP RATE SAYS I!” one last time. There were reports that he was struggling to draw a weapon to use against the guards. However, the pocket he was reaching for was later determined to contain only a small citrus fruit. Sources close to the League anticipate that a fourth faction will be granted authorization to stake its claim on the Fields and explore the new continent. Summoners from Zaun have been seen in frequent consultation with high-ranking members of the Council in recent days. Summoners who declared for Zaun in Hextech Revolution may cast their viktory vote here. See you on the Fields, Summoners! ‹ Intermission Tournament IV continues Sunday, August 10! Looks like the makings of an interesting arc! I don’t feel as bad that I didn’t make the tough decision of voting for factions because I would have voted Ionia, Freljord, Shadow Isles. Considering how many votes Freljord got, antebellum Zaun will likely vote them in. All is well that ends well! Well, I’m buying Varus. This’ll be my first arch. Should be fun. That near victory of Ionia over Freljord. And I REALLY wanted Freljord to be in this, oh well.